datacollection stops after making changes in "Schedules Outages"
When we make any changes in "Scheduled Outages" the datacollection is stop working. OpenNMS need a restart in this case. 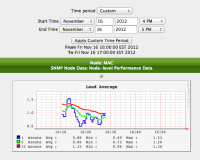 The datacollection don't work and the "Resource Graphs" (RRD) have no new values from this moment.